Good Morning! 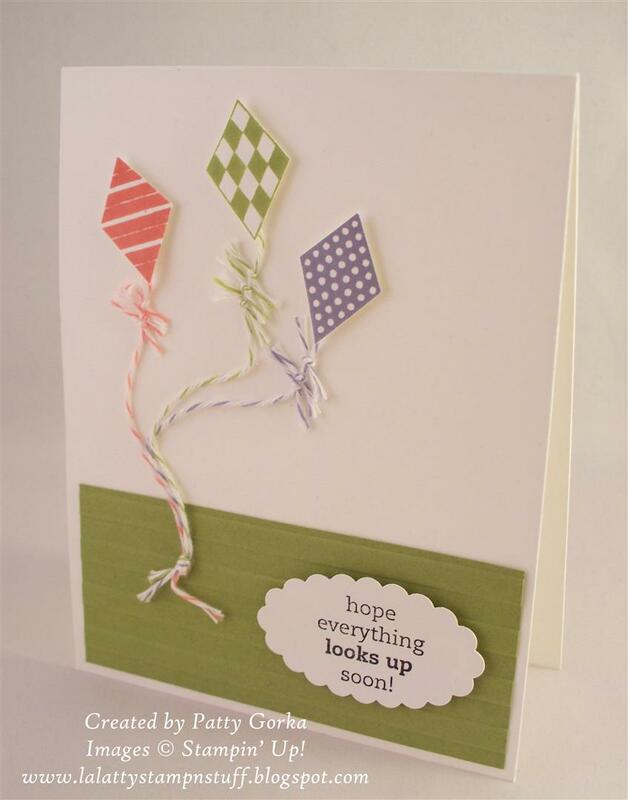 Today's clean & simple challenge on splitcoast stampers is to find ways to use twine. I knew as soon as I saw the challenge that I wanted to pull out my kite stamp set and use the twine for the kite strings. I stamped and cut out the kites and then I glued the twine on the back of the kites and then I placed them on my card using dimensionals. I added three small pieces of twine on each strand which I thought would mimic bows that you sometimes see on kite strings. The lucky limeade card stock along the bottom of my card was dry embossed using my big shot and my stripes embossing folder. I wanted to keep the rest of my card simple so I decided to add my sentiment on a punched out scallop oval. So what do you think? I hope you like it! Thanks for stopping by and have a wonderful day! Patty, I've been missing lots lately. All your cards are so beautiful!!!. I need to continue with my Christmas ones as well. Love how clean and neat your cards are. Love your style!!! What a fabulous cas card. Love the design of the kites and love the matching twine. Grat way to use twine! Very sweet card! I really like this card. So simple and fun - love those kites and the colorful string!